Shalbourne Gliding has a group of female pilots who are dedicated to the sport of gliding, but they’re not the first! Gliding – and aviation – in the UK has many famous pilots, some of whom have had some great achievements. Gliding is a sport which is open to everyone. Women are equally capable of flying gliders as men, in fact it could be said that in some ways we often make better pilots (*Shhh, don’t tell the men! *) as we demonstrate a greater sensitivity to the feel of the aircraft and the air around it. However we often suffer from lower confidence in our abilities, which may explain why there are fewer women in gliding than men. Flying a glider doesn’t require physical strength, just the ability to fly the glider well and ‘read’ the sky to make the most of the weather. 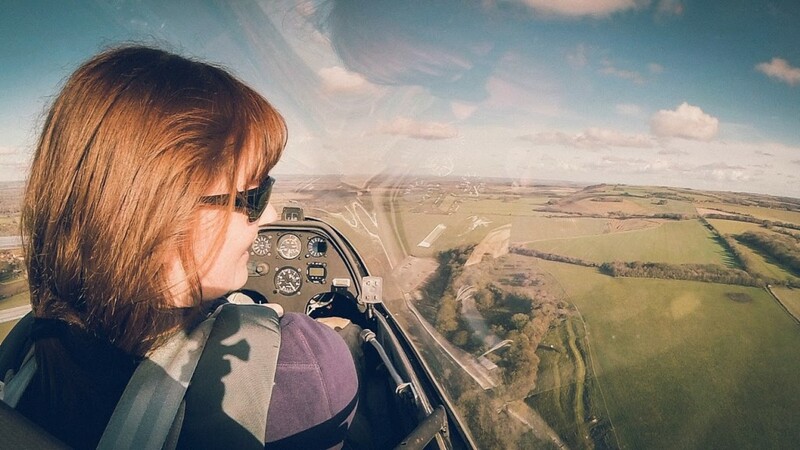 We have a team of instructors (both female and male) who will teach you to fly using an approved BGA training syllabus, so everyone is trained to the same standard. Once you’ve learned to fly and gone solo, you might wish to fly the glider ‘cross-country’, which involves using the energy in the sky to fly to different places. Some of these might be miles away; flights of 100-200 miles are common and it’s possible to go even further once you’re skilled enough! Our skilled team of instructors will guide you towards this goal, and you’ll find lots of encouragement from the other members – lots of us have been there! There’s nothing nicer than sitting in the cockpit on a warm summer’s day, under a blue sky! It gives you a sense of freedom that you don’t often get in day to day life. It sounds corny, but it really is as close to being a bird as you’ll ever get! The UK has a Women’s Gliding Team who fly in competitions worldwide and hold several records. These lovely women also head a group who support and encourage women in gliding! Their website has all sorts of useful information for women who glide and women who want to learn to glide! If you’re interested in learning to fly, then please come along and have a Trial Lesson with us to see if you like it.